If someone asked me, how to define what the gym is, I think this would be my answer: “A place where I go once every two months to convince myself I do regular exercise. Oh and a place that makes you looked like a red faced puffer-fish.” Okay I’ll admit it, the gym isn’t exactly my best friend. If anything, it is my mortal enemy that I wish (at a stretch) to battle every time I step through the automatic doors of doom, where all things humiliating happen. Whenever I go, I always bump into someone I know, in which I feel like I have to impress by running as fast as I can on the treadmill. Resulting in, falling off, flat down with my face bumping off it as it still speeds on. To top it off, a sweat patch forms where it shouldn’t be on my grey tracksuit bottoms. Word of advice girls, do not wear grey when working out, unless of course you wish for the old couple that always use the sit down bikes to ask if you’ve had a ‘little accident’. You can imagine the shame. It’s not as if the gym is an attractive place to be. Unless you are the big bulky guys that women melt over, or the naturally skinny girls, who make the spin classes and running look so effortless, that you feel like a sweaty Shrek next to them. I don’t think I’ve ever walked into the gym thinking I’m going to turn heads when I walk in, but no matter what, I always get the feeling I’m going to meet someone new, someone who may become a love interest. Why do we think that? It never happens but the thought always pops into my head. What if he’s in here? What if we magically go for the water fountain at the same time and fall in love at first sight? You have also probably gathered from this how delirious I am too. The gym is suppose to be a place where we go to tone up, feel healthier, change things that we are self-conscious of and just genuinely keep fit. So why is it so hard to get motivated? I never feel like I want to go to the gym, more like my body needs to. Going to the gym is more like a fear. Going there getting all gross with greasy hair, sweat patches and huffing and puffing over every piece of equipment doesn’t seem like that ideal way to spend two hours of my life… every other day… every week of the year. However swimming is a better option for me, when I’m actually in the water. Getting from the changing rooms, to the poolside, to the showers, then into the pool is like a mission. These are the times I wish I was a super cool, super fast ninja so no-one would see my wobbly legs and chubby waistline along the way. But once I’m in, it’s all dandy. Though I must confess, I swim about five lengths, give up and spend the next half an hour in the jacuzzi, which is relaxing and friendly to be fair. No-matter who’s in there with you, they will always spring up a conversation, and to be honest I’m now friends with a couple of regulars thanks to these bubbly acquaintances. This is probably the only upside of ‘the gym’, and getting 25% off the sports shop above, which is handy for male’s birthday/Christmas presents. Overall, I always vow to go to the gym more, but I know, and now you know from this ramble that I probably won’t. 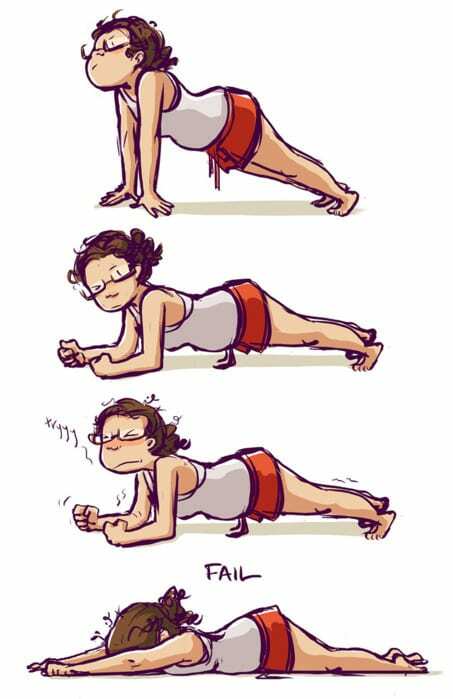 Is there an easier way to keep fit without feeling this way?